Okay the New Year started a little over a week ago, but the Christmas season took so much out of me I’m only getting around to posting today. I’ve been struggling to keep this blog going because of my busy life. However knitting is an integral part of that busy life and I want to share with other knitters what I’m doing, learning and find interesting on the subject. My knitting keeps me sane as well as provides me with beautiful, warm and functional things for myself and those people I care about. I will do my best to keep this blog going and I hope you will keep coming back and reading and commenting. I have to say that I’m amazed that I started the first Good Knit blog 10 years ago and managed to keep it up all this time. Time to get back to sharing my latest knitting project which this blog is about. 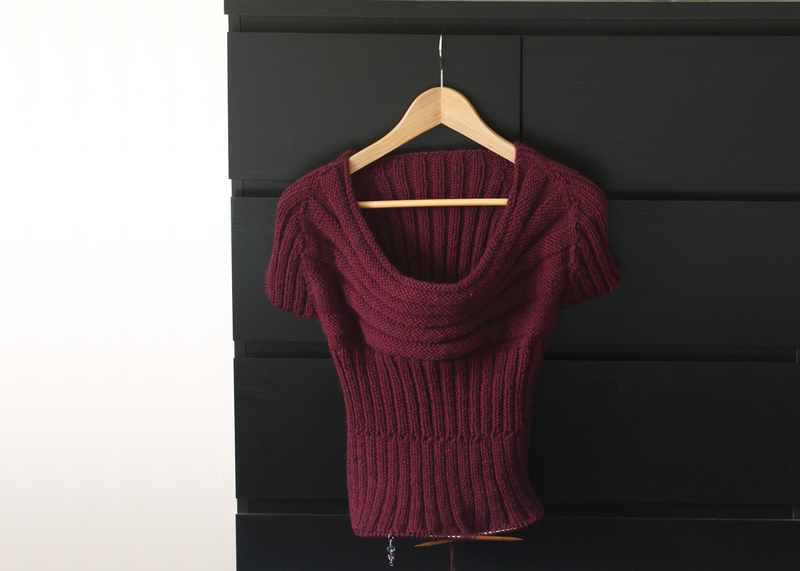 Here is the progress on my scoop neck sweater. I love knitting top down, raglan sleeve sweaters like this. I think partly because you can see the sweater grow (looking like a sweater not just pieces of one) right before your eyes. When I was 13 I started knitting ski sweaters and they became my favourite for years. Maybe my next pattern design will be a yoke style sweater.